The history of civil rights in America has been marked by the hard-won progress of one category after another of oppressed and marginalized citizens who stand up and demand recognition, respect, and equal access to the benefits of modern society. 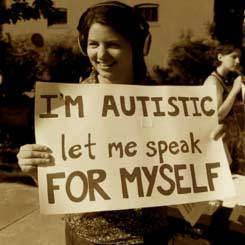 William Davenport's film Citizen Autistic brings us an inside look at the front lines of the autistic civil rights movement, showcasing autistic activists and self-advocates on the front lines of this struggle for inclusion, and freedom from persecution. Featuring notable figures such as Ari Ne'eman, president of the Autistic Self Advocacy Network, and Landon Bryce, of thAutcast.com, this documentary details what the emerging neurodiversity movement is up against, from the torturous electroshock "treatment" that takes place at the Judge Rotenberg Center in Massachusetts, to the dehumanizing and alarmist marketing campaigns of fundraising juggernaut Autism Speaks. Promoting a philosophy of neurological variation as simply another aspect of human diversity, these tireless activists embody the call of the disability rights movement: "Nothing About Us, Without Us."